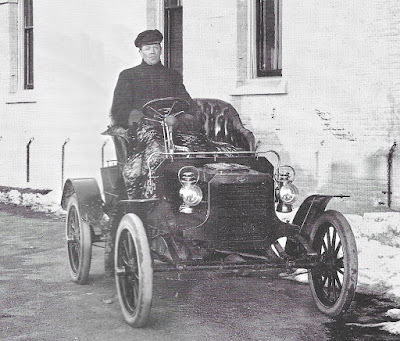 Ransome Eli Olds had set up the Olds Motor Works in 1899 but left the company in 1904 over his disagreement to phase out the curved dash Oldsmobile. He immediately set up a new company called the R.E.Olds Company but the Oldsmobile company objected and Olds renamed his company the Reo Motor Car Company. 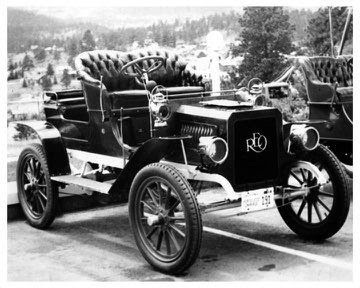 Olds completed his first Reo motor car in late 1904 and it was introduced at the New York Automobile Show in January 1905. The first Reo was a 16 hp two-cylinder five-passenger tonneau, which was joined by a 7-1/2 hp single-cylinder runabout. In 1905 a Reo was driven across America twice, the first ever double transcontinental trek by an automobile. A four-cylinder model was offered in 1906 but it was the two-cylinder car that received the most Reo publicity and achieved the best sales. In 1907 Ransome Olds achieved the industries third best sales after Ford and Buick. Some commercial vehicles were produced earlier but full commercial vehicle production began in 1908 and was to become a very successful business. A new 35 hp four-cylinder Reo car appeared in 1909 and was also a great success. In 1910, Reo established a manufacturing plant in Canada at St. Catherines, Ontario but this venture was finished in 1913. In 1912 Ransome Olds introduced Reo the Fifth as "The Car That Marks My Limit" and he also said "I call it My Farewell Car". But, this was not the end of the Reo. 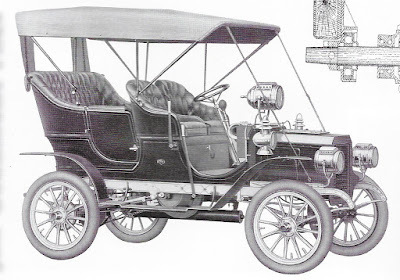 In 1916 a fine 45hp six-cylinder model was added to the Reo line. During the First World War Reo was kept busy building trucks for the war effort and remained profitable. Following the war Reo moved to six-cylinder models and the last four-cylinder model was offered in 1919. The Reo Flying Cloud appeared in 1927 and was successful initially. Some months later a cheaper companion car called the Wolverine was introduced (see Wolverine) but it was superseded in 1929 by a smaller version of the Flying Cloud. By 1931 the Great Depression saw Reo losing money and then the Royale arrived. The Royale was the most fabulous of all the Reo cars, a 125 hp straight-eight with coachwork by Murray. But by 1934 Reo was in serious financial trouble. Ransome Olds gave up control of the company and in 1936 the Reo company gave up passenger car production and decided to concentrate solely on commercial vehicles (see Reo Trucks). 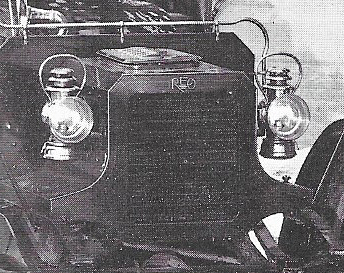 The earliest Reos in 1904 did not carry a metal radiator emblem but may have displayed a "Reo" decal. Ransome Olds had used a colored decal on the curved dash Oldsmobile in 1901, so it is possible that a "Reo" decal was used from 1904 but I cannot confirm this. 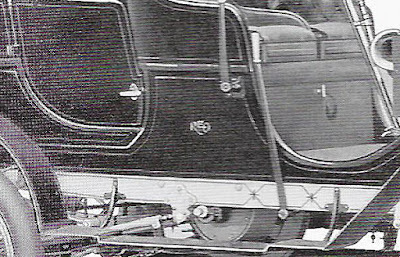 The first Reo cars also showed the Reo name on the serial plate, which was usually attached to the body under the driver's seat. 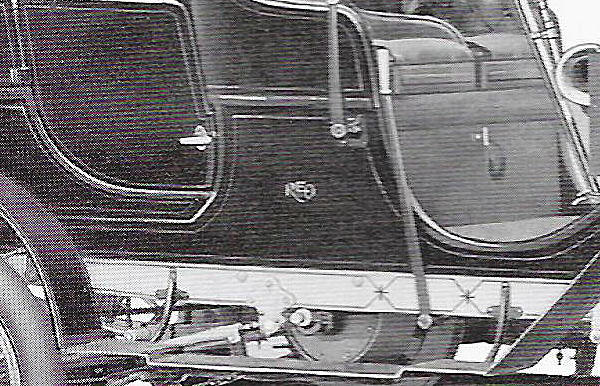 The Reo serial plate shown below is a very early 1905 plate showing the production number 166. This Reo serial plate is very rare. The Reo serial plate design was changed later in 1905, see example below from 1906. These early Reo serial plates are rare. Brass scripts were being displayed on the radiator core of motor vehicles in America from as early as 1905 but there is no evidence that they were used on Reo cars at this time. However, there is doubt as to whether this is indeed an original factory photo. There are indications that this may be a later photo of a restored 1906 Reo. In any event, I suspect that the Reo radiator script was not in regular use on Reo motor vehicles until after 1907. 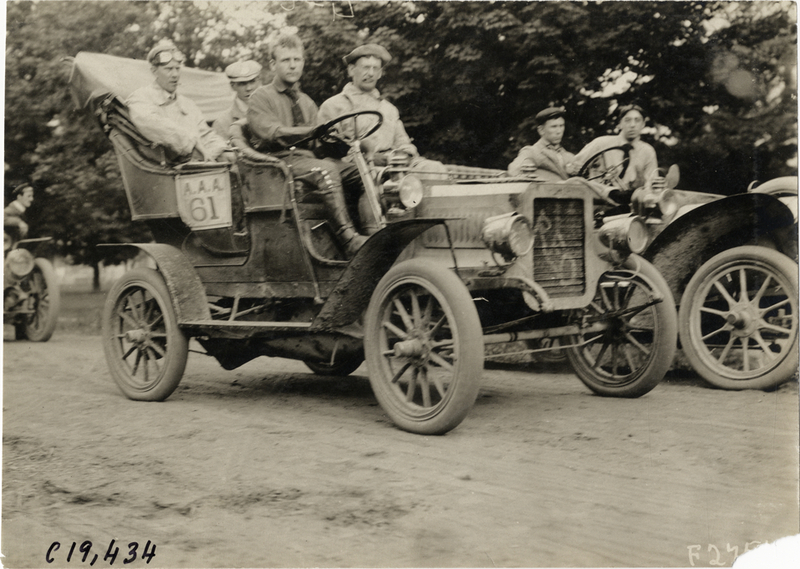 Photos of a Reo car taking part in the 1906 Glidden tour show the name "Reo" painted on the radiator grille, presumably for publicity purposes, see photo below. This would have been unnecessary, if a large brass Reo radiator script had been in regular use at that time. Brass Reo radiator scripts were certainly in use in 1907 and continued in use on Reo cars through 1910 and on Reo trucks until 1916. Reo radiator scripts usually had the letters attached to each other, see example shown below, but some had separated letters. Reo radiator scripts were made in several sizes. Genuine original Reo scripts are scarce. The first Reo radiator emblem was made of brass and probably painted black, see example above at the top of this post. This type of Reo radiator emblem was used on Reo cars from about 1907 and later on Reo trucks. This Reo radiator emblem is scarce. 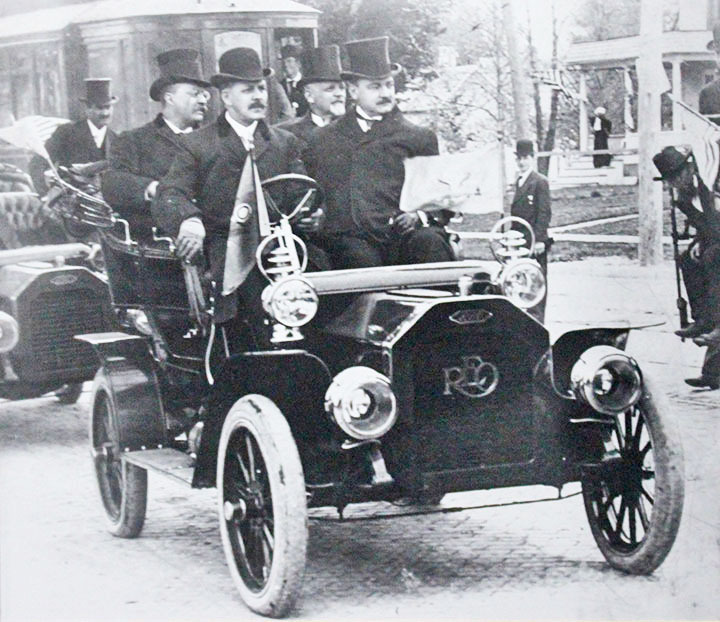 The following original photo taken in 1907 shows President Teddy Roosevelt riding in a Reo displaying a Reo radiator emblem and radiator script. It is interesting to note that the Reo car following President Roosevelt does not carry a Reo radiator script, suggesting that the Reo radiator script may not have been in regular use even in 1907. The first Reo radiator emblem finished in enamel was used for the 1910 model year, see example below. This blue and white enamel Reo radiator emblem is extremely rare. But, beware as there are reasonably good reproductions of this emblem but with clean flat backs with no fixing studs. The original emblem has two fixing studs. The first Canadian Reo used a very similar radiator emblem, see example below. This Canadian Reo radiator emblem is also extremely rare. The Reo radiator emblem shown below is finished in unusual colors and may be a reproduction, but why reproduce an emblem in entirely the wrong colors? The emblem otherwise appears authentic and does not seem to have been recently re-enameled. I have no idea what this Reo emblem was used for. If you have any information about this emblem, please let me know, in order to update this post. The down-turned wings on the first enameled Reo radiator emblem produced a rather sad expression, but the emblem design was changed a year later to up-turned wings, which gave a much happier appearance, see example below. This attractive blue, green and white enamel Reo radiator emblem is very rare. I have not seen the Reo emblem shown above marked St Catherines, Ontario but such an emblem may exist and, if so, would be extremely rare. If you have details of such an emblem, please let me know, in order to update this post. radiator emblem is finished in white, red, white and blue enamel and is scarce. But, beware, there are unmarked die stamped reproductions of this emblem with an internally threaded stud at the back. The following photo shows a slightly smaller variation of the Reo The Fifth radiator emblem. Since the Reo plant in Ontario was still operating in 1912, it is possible that the Reo The Fifth emblem may also exist marked with the St Catherines location and, if so, it would be extremely rare. If you have details of such an emblem, please let me know. The six-cylinder Model T6 introduced in 1920 carried a new radiator emblem finished in white, blue and black enamel, see example below. 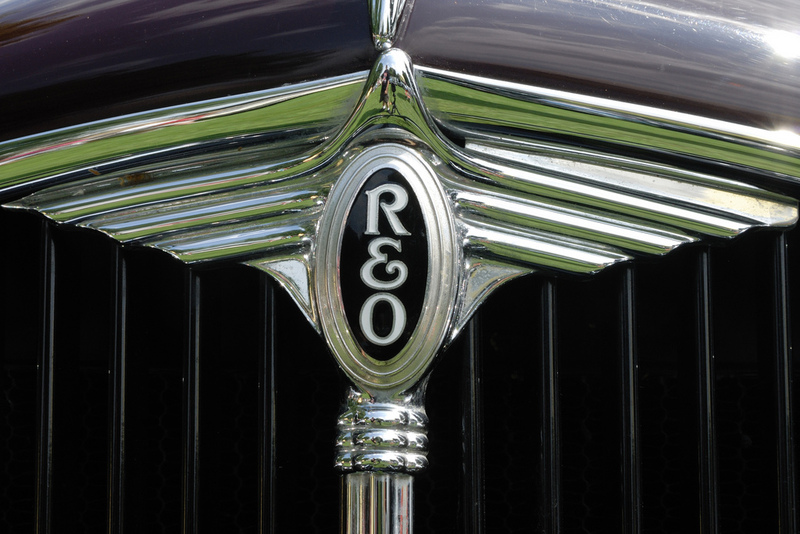 This Reo radiator emblem is relatively easy to find, as it was used on many Reo car models and the Model F Speedwagon into 1926. The six-cylinder Reo Flying Cloud introduced in 1927 displayed a completely new radiator design finished in red and white enamel, see example below. This Reo radiator emblem is relatively easy to find, as it was used on Flying Cloud cars, except the Flying Cloud Mate, from 1927 to 1930. The very small Reo emblem shown below was a headlight emblem used on the Reo Flying Cloud. This Reo emblem is rare. The following Reo Flying Cloud emblem is made of thin brass plate. The motive design has some similarities to that shown on advertisements for the 1927 Reo Flying Cloud sedan but I cannot confirm that the emblem was used on this model. If you can identify this emblem, please let me know in order to update this post. The following Reo Flying Cloud brass radiator script may have been a factory optional item or may have been provided by Reo dealers. Original Flying Cloud scripts are scarce. The following Reo radiator emblem was used on the six-cylinder Reo Flying Cloud Mate from 1929 and on the Reo Flying Cloud Model 15, which replaced the Flying Cloud Mate in 1930 until early in 1931. This Reo radiator emblem, finished in red and white enamel, is scarce. The following emblem is an ultra rare oddity. It closely resembles the previous Reo radiator emblem and is exactly the same size. It is thought to have been a trial emblem for the Flying Cloud Mate but was not selected for use. In 1931, a new radiator emblem design finished in black and white enamel was used on Reo Flying Cloud models having a flat radiator, see example below. This Reo radiator emblem is scarce. 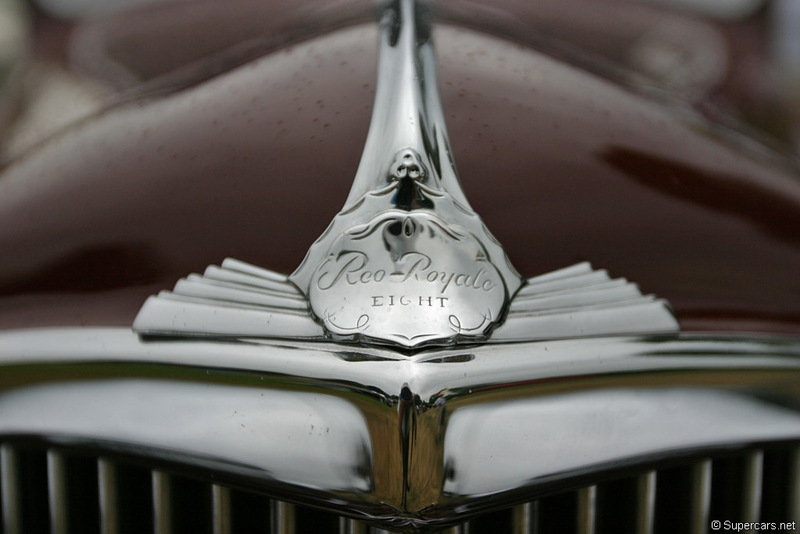 Reo Flying Cloud models using the Royale style radiator in 1931 to mid-1932 used a similar combined emblem/grille ornament to the Royale but with "Flying Cloud" lettering. If you have a good photo of the "Flying Cloud" version of this emblem, please send me a copy in order to update this post. There was no radiator emblem on the Reo Flying Cloud for 1935. For 1936, the final year for Reo passenger cars, Flying Cloud models had a completely new red painted emblem attached to the radiator grille with circular emblems, also finished in red, attached to each side of the hood, see examples below. These Reo emblems are scarce.